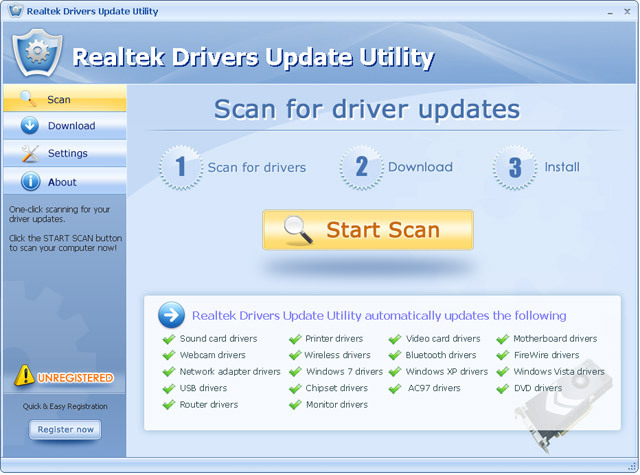 Realtek Drivers Update Utility updates your system drivers for Realtek devices automatically with just several clicks. It will scan your system first then download and install Realtek official drivers to let your Realtek device work properly. The Realtek Driver Update Utility keeps your system up-to-date. Realtek Drivers Update Utility detects which driver updates are relevant to your computer, and then helps you install them quickly and easily. Update your Realtek drivers automatically with several clicks. ...... from the ground up using the latest technology with over 10 years' experience in the driver scanning/detection industry. Machine Intelligence. Drivers Update Utility Machine Intelligence identifies your specific computer to provide you with the most accurate drivers available. Manufacturers supported by Drivers Update Utility include: Dell, HP, Compaq, Gateway, and more. Largest Drivers Database. We have the largest drivers database in the world which contains more than 1,000, 000 drivers and is rapidly increasing day by day. 24x7 Technical Support. Free technical support from a team of experts who helped develop the product! 24-hour turnaround time. Wide system compatibility. Guaranteed to be fully compatible with all versions of Windows including Windows 7. Qweas is providing links to Realtek Drivers Update Utility 3.2 as a courtesy, and makes no representations regarding Realtek Drivers Update Utility or any other applications or any information related thereto. Any questions, complaints or claims regarding this application Realtek Drivers Update Utility 3.2 must be directed to the appropriate software vendor. You may click the publisher link of Realtek Drivers Update Utility on the top of this page to get more details about the vendor.